The AGM-65 Maverick is a tactical, air-to-surface, infra-red or electro-optically guided missile. Although primarily employed in the Close Air Support mission, the Maverick is equally effective in the anti-armor, SEAD and interdiction roles. Unit cost ranges from USD $48,000 (A-model) to USD $269,000 for the G-model. The AGM-65 Maverick program was approved in 1965, after the miserable performance of the command-guided Bullpup missile in Vietnam. Assignment of the production to Honeywell took place in June 1968, after competition with Rockwell. Key features of the design include the compact dimensions, allowing for multiple carriage, autonomous guidance system, and high Pk (Probability of Kill). Unguided flights began in September 1969, and AGM-65A Mavericks have been launched at all heights down to treetop level. During the first 1,221 firings, the Maverick demonstrated an 86% hitrate, and an average miss-distance against tank-sized targets of only 3ft (0.91m). An initial production batch of 17,000 rounds was completed in 1975, after which production of later versions continued at a reduced rate. The AGM-65B was in production from May 1980 to May 1984, and total A/B production totaled 31,022 rounds. Top production rate for the B-model was as high as 200 missiles / month. Flight testing of the AGM-65C started in January 1977, using the Rockwell tri-service seeker head. In May 1977, engineering development began on the AGM-65D. The IIR (Imaging Infra Red) is considerably more expensive than the other Maverick versions, but enabled far greater lock-on ranges. The AGM-65D was first tested in Europe in January-March 1978, the carrier aircraft being an F-4. The C model was replaced by the AGM-65E, although the latter experienced a serious delay with the laser seeker. The basic missile has four low-aspect ratio delta wings, four tail controls located immediately behind the wings, and a dual-thrust solid motor. The standard AGM-65A has a 130lb (59kg) warhead, while a heavier 250lb (113kg) Mk.19 blast/fragmentation warhead can be fitted on for example C and D models for use against small ships or hard land targets. The Mk.19 warhead requires a 4in (102mm) increase in length. The AGM-65E/G are fitted with a heave penetrator warhead, weighing an impressive 300lb (136kg). In December 1986, the Air Force also briefly considered fitting a nuclear warhead to the Maverick. The warhead is located aft of the seeker, but the latter incorporates a tunnel to allow the jet of hot gasses (generated by the explosion of the charge) to pass freely. The 65F penetrator warhead is fitted with selectable fuzing, which can be set to detonate on impact or after penetration. The standard model offers simple TV guidance (with the seeker logic being able to distinguish on contrast) and requires favorable launching conditions. Less-than-perfect visibility or overwater glint can cause the A-model to break its lock. The optical seeker of the AGM-65A covers a 5° cone in front of the missile - roughly the equivalent of a 200mm lens on a standard 35mm camera. The AGM-65B Scene-Magnification Maverick offers new optics, a stronger gimbal mount and revised electronics. The new optics offer greater magnification (2.5° cone, equivalent to a 400mm lens on a 35mm camera), thus allowing the pilot to search for the target with the seeker of the missile and detect it at greater ranges than with the Mark 1 eyeball. The AGM-65C Laser Maverick was specifically designed for use in the Close Air Support Role again laser-designated targets. The laser designators are either land- or airborne, for example: the infantry ILS-NT200, the airborne Pave Knife, Pave Penny, Pave Spike, Pave Tack or other non-US systems such as the French Atlis-pod used on Pakistani F-16s. By using different illuminating frequencies for different targets, it is possible to ripple-fire multiple missiles at multiple targets. IR wavelengths are less attenuated in clear air. The 65D is the standard Maverick for use in combination with the LANTIRN targeting and navigation pods. Furthermore, the IR seeker allows the Maverick to be employed around the clock. The AGM-65E has a large penetrator warhead of 300lb. The AGM-65F is used by the US Navy and is almost identical to the AGM-65D, except that it has the larger 300lb warhead of the AGM-65E and has modified guidance software to give it optimum homing capabilities against seaborne targets. The AGM-65G is used by the USAF and has the IIR seeker and the 300lb warhead. F-16XL, armed with 6 AGM-65 Mavericks and 2 AIM-9 Sidewinders, launching a Maverick. The Maverick can be carried by a variety of aircraft, ranging from combat aircraft such as the A-10 and F-16 to the BGM-34 RPV, either in triple clusters or singly (on the F-5 and the BGM-34 for example). The triplet configuration requires the use of the LAU-88/A or LAU-88A/A launchers, while the LAU-117/A is the single-rail launcher. A modified version of the LAU-88/A is usually fitted to high-performance aircraft, offering a reduced-drag (as much as 45-60 percent in certain flight profiles) fairing. Other modifications to the LAU-88/A allow for testing a three-round load as a single assembly, boresighting all missiles to the piper and slaving the seeker head of a missile to the head of another missile. The LAU-88 triplet launchers can only be fitted to nr. 3 and 7 station, whereas the LAU-117/A can be fitted to nr. 3,4,6 and 7 station. The F-16XL is an exception: to minimize drag it carries 6 missiles on LAU-117A single-missile launchers. The pilot selects the missile (described here for the AGM-65), causing its gyro to run up to speed and light a cockpit indicator. The pilot then visually acquires the target, depresses his uncage switch (which means the missiles seeker is enabled to 'look around' for targets), and activates the video circuitry. 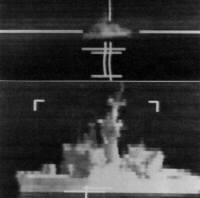 The TV picture (as seen through the missiles Video system) appears at once on a bright display in the cockpit, and the pilot then either slews the video seeker in the missile or else lines up the target in the head-up-display. He depresses the track switch, waits until the target is aligned with the crosshairs on the TV display or the HUD, releases the switch and fires the round. The onboard image-processor of the missile analyses the high-contrast areas of the image to sense relative movement and generates correcting guidance signals to keep the missile aligned on the target. One major drawback of the A-model was the limited range at which the TV-seeker could lock on: although the missile has a range of up to 7nm (13km) under the worst possible circumstances (a low and slow aircraft), attenuation at optical wavelengths limits lock-on range to about 3nm (5.5km). Furthermore, the AGM-65A needs 4-8 seconds to lock on, which is an eternity on the modern battlefield. The effective range of the AGM-65 Maverick greatly varies with the launch altitude and the speed of the launching aircraft. Other models offer infrared targeting (AGM-65D) or laser-homing (AGM-65C). On LANTIRN-equipped aircraft, the Maverick can be slaved to the FLIR-pod of the LANTIRN system, and of course LANTIRN can laser-designate targets for the Maverick. The Maverick was used to good effect in the 1973 Yom Kippur War, although it needs to be said that the operating conditions were ideal (good visibility, over-land use). During operation Desert Storm, more than 5,000 Maverick missiles were fired, mainly from A-10 and F-16 aircraft. Power Plant: Thiokol boost/sustain solid motor TX-481. Later replaced by the reduced-smoke TX-633 engine. Guidance System: optical, IIR or laser. Unit Cost: USD $48,000 (A model), $64,100 (B), $110,000 (C), $111,000 (D), $101,000 (E) and $269,000 (G).